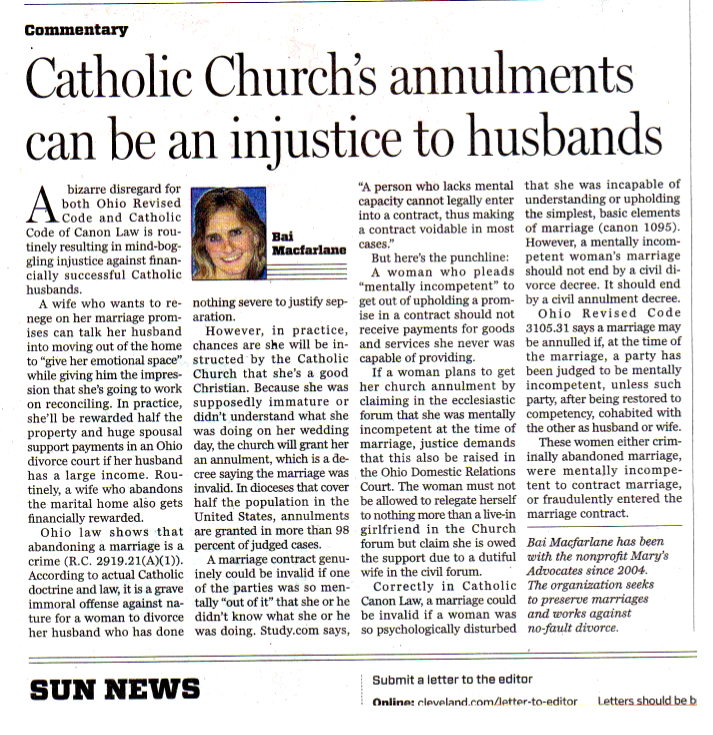 A bizarre disregard for both Ohio Revised Code and Catholic Code of Canon Law is routinely resulting in mind-boggling injustice against financially successful Catholic husbands. This past Sunday, October 16, the Cleveland Plain Dealer published in their news website my column about the injustice experienced by high-income-earning men in divorce court. 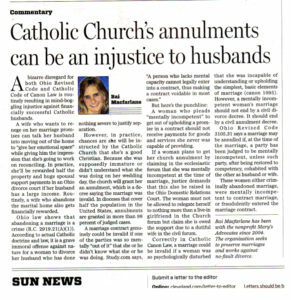 I opened by asserting that, “A bizarre disregard for both Ohio Revised Code and Catholic Code of Canon Law is routinely resulting in mind-boggling injustice against financially successful Catholic husbands.” (See column below). The column was pulled from the website three days later. One evening, I pointed dozens of local lawyers to the column. The next day, the column was removed from the internet. My column was, however, printed in the weekly Sun News newspapers which is somehow affiliated with the Plain Dealer, and has different editors. Google Search shows the column’s title with the Plain Dealer, but the link goes nowhere. The editor’s contact us information is here. I’d be pleasantly surprised if an investigative reporter will be assigned to ask the divorce lawyers or judges a question. (C)(1) Except as provided in this division or division (E) of this section, the division of marital property shall be equal. If an equal division of marital property would be inequitable, the court shall not divide the marital property equally but instead shall divide it between the spouses in the manner the court determines equitable. Guest columnist Bai Macfarlane has been with the non-profit organization, Mary’s Advocates since 2004. The organization seeks to preserve marriages and works against no-fault divorce. A wife who wants to renege on her marriage promises can talk her husband into moving out of the home to “give her emotional space” while giving him the impression that she’s going to work on reconciling. In practice, she’ll be rewarded half the property and huge spousal support payments in an Ohio divorce court if her husband has a large income. Routinely, a wife who abandons the marital home also gets financially rewarded. The Ohio law shows that abandoning a marriage is crime (R.C. 2919.21(A)(1)). According to actual Catholic doctrine and law, it is a grave immoral offense against nature for a woman to divorce her husband who has done nothing severe to justify separation. However, in practice, chances are she will be instructed by the Catholic Church that she’s a good Christian. Because she was supposedly immature or didn’t understand what she was doing on her wedding day, the Church will grant her an annulment, which is a decree saying the marriage was invalid. In dioceses that cover half the population in the United States, annulments are granted in over 98 percent of judged cases. A woman who pleads “mentally incompetence” to get out of upholding promised in a contract should not receive payments for goods and services she never was capable of providing. The man who is not married is not obligated to give away half the property he bought, or pay spousal support. 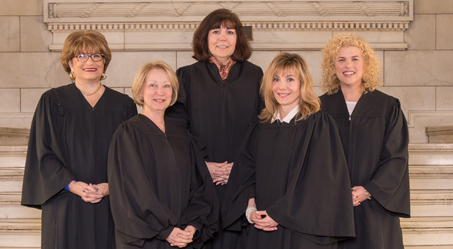 If a woman plans to get her church annulment by claiming in the ecclesiastic forum that she was mentally incompetent at the time of marriage, justice demands that this same fact pattern must also be raised in the Ohio Domestic Relations Court. The woman must not be allowed to relegate herself to nothing more than a live-in girlfriend in the Church forum but claim she is owed the support due to a dutiful wife in the civil forum. The “Official Catholic Directory” shows there were 2,076 Catholic weddings in the Cleveland diocese in 2015. Correctly in Catholic Canon Law, a marriage could be invalid if a woman was so psychologically disturbed that she was incapable of understanding or upholding the simplest, basic elements of marriage (canon 1095). However, a mentally incompetent woman’s marriage should not end by a civil divorce decree. It should end by a civil annulment decree. Ohio Revised Code 3105.31 says a marriage may be annulled if at the time of the marriage, a party has been adjudicated to be mentally incompetent, unless such party after being restored to competency cohabited with the other as husband or wife. If abandoning wives were expected to explain themselves, reliable husbands would not be forced to give these women half their property and long-term spousal support. These women either criminally abandoned marriage, were mentally incompetent to contract marriage, or fraudulently entered the marriage contract.